Cody’s best friend, Spencer, and his parents are moving in with his grandmother right around the corner, and Cody can’t wait. 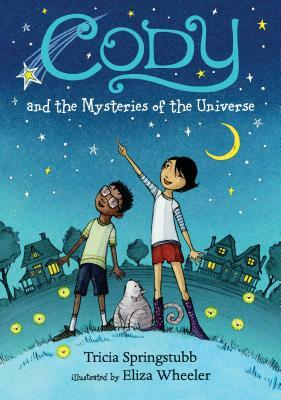 For one thing, Cody needs Spencer to help solve the mystery of the never-seen Mr. Meen, who lives on the other side of the porch with a skull-and-crossbones sign in the window and an extermination truck out front. How’s Cody to know that a yellow jacket would sting her, making her scream “Ow! Ow!” just as they start spying? Or that the ominous window sign would change overnight to “Welcome home,” only deepening the mystery? In this second adventure, Spencer’s new-school jitters, an unexpected bonding with a teacher over Mozart, and turf-claiming kids next door with a reason for acting out are all part of Cody’s experiences as summer shifts into a new year at school. Tricia Springstubb is the author of Cody and the Fountain of Happiness, illustrated by Eliza Wheeler; the picture book Phoebe and Digger, illustrated by Jeff Newman; and other books for children. She has worked as a Head Start teacher and a children’s librarian. She lives in Cleveland Heights, Ohio. Eliza Wheeler is the illustrator of Tricia Springstubb’s Cody and the Fountain of Happiness and the Newbery Honor Book Doll Bones by Holly Black, among other books for young readers. Originally from northern Wisconsin, she now lives in Los Angeles. Understated illustrations subtly reinforce these diverse identities and bring the cozy world to life. A perennial message, "different strokes for different folks," delivered with affection and tolerance, 21st-century style. Cody makes some keen observations about both herself and those around her. Those insights often lead to more questions than answers for her titular mysteries, but she remains more filled with awe and wonder than cynicism, making her an endearing heroine for kids just starting to puzzle out their own universes. Wheeler’s monochromatic illustrations add depth to many of the characters—slouching Spencer as he heads to school, Wyatt’s rueful smiles as he hangs out with Cody—and the homey details complement the warmth of the text. Readers of all ages will readily relate to Cody and the characters around her. This book is perfect for young readers ready to move on from beginning books and early readers. This sequel displays Springstubb’s knack for understanding the ever-shifting questions held by readers this age as their awareness of the universe around them grows in leaps and bounds. Brimming with charm, delight, and a diverse cast of characters. Tricia Springstubb...has created an irrepressible free spirit in Cody and this charming novel for young readers is told from Cody's point of view.